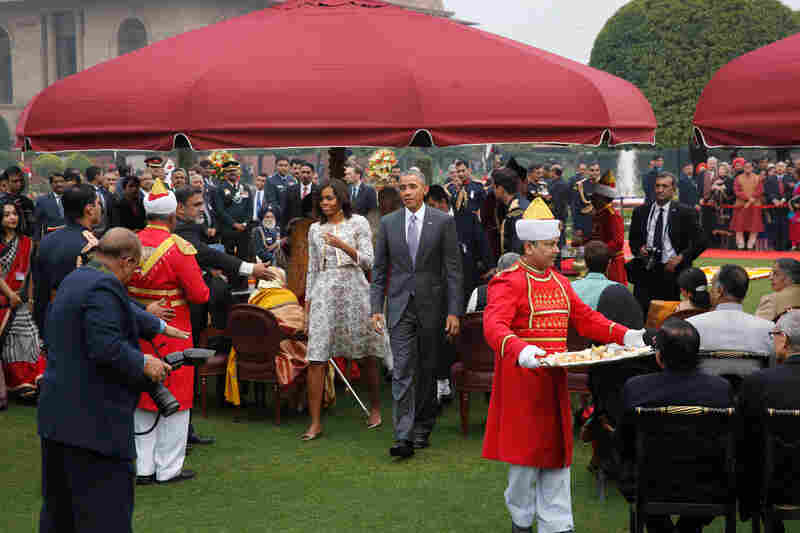 Obama Attends India's Republic Day Celebrations : The Two-Way The president became the first U.S. head of state to attend a parade to mark the day India adopted its constitution. 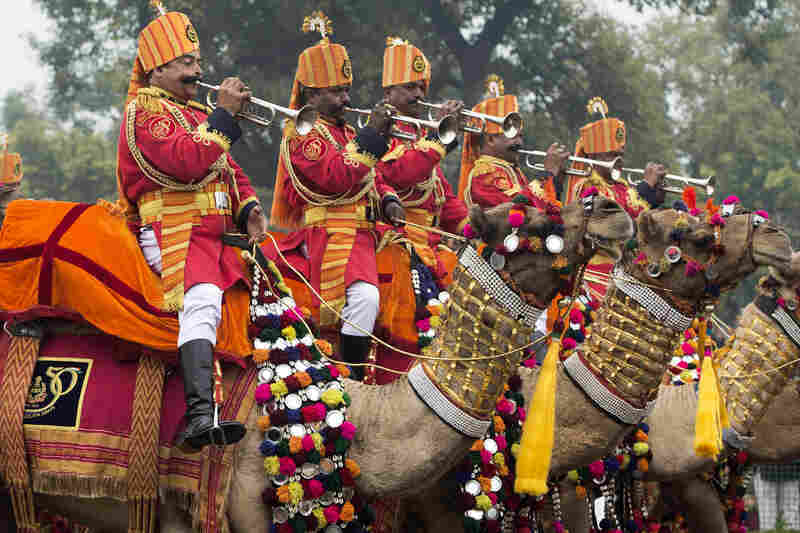 Trumpeters from the Indian Border Security Force's Camel Mounted Band play during the nation's Republic Day parade in New Delhi on Monday. Rain failed to dampen spirits as President Obama became the first U.S. president to attend the spectacular military and cultural display. Obama, Indian Prime Minister Narendra Modi (right) and Indian President Pranab Mukherjee attend a reception at Rashtrapati Bhawan, the Presidential Palace, in New Delhi on Monday. 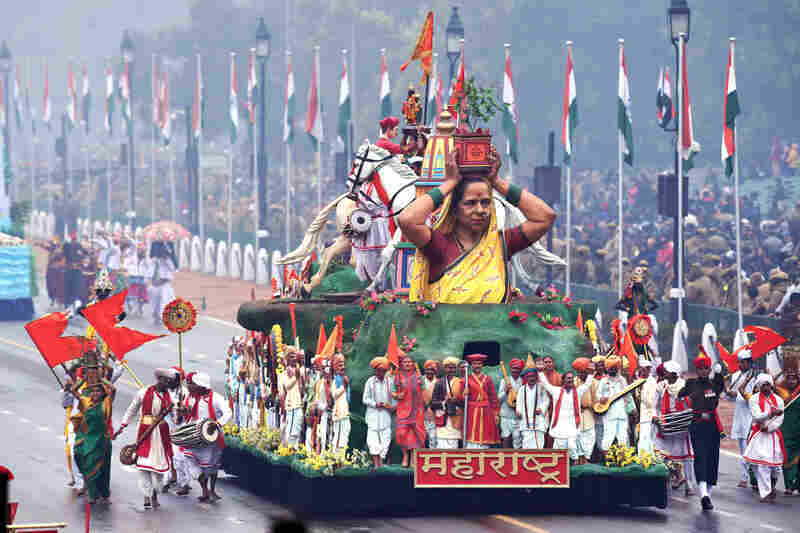 Indian performers walk alongside a float representing the state of Mahrashtra during the parade. 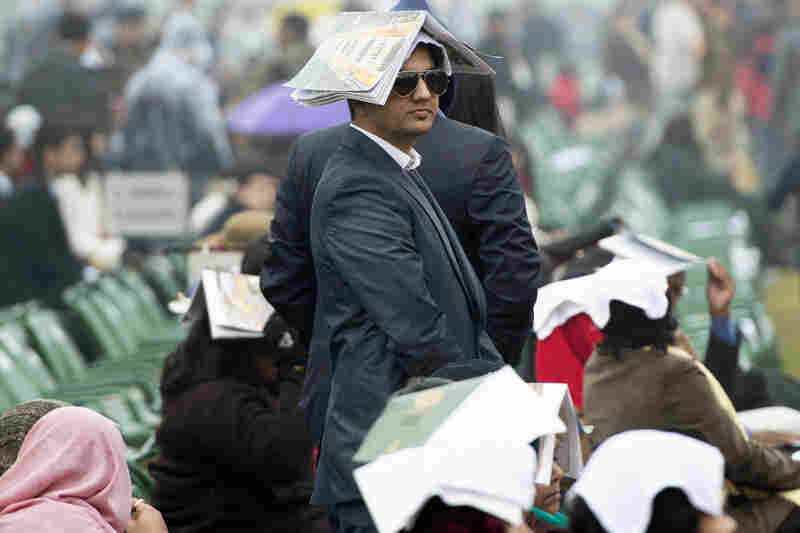 A spectator tries to protect himself from the rain as he watches the parade. Indian paramilitary soldiers march during the parade, marking the anniversary of India's democratic constitution taking force in 1950. 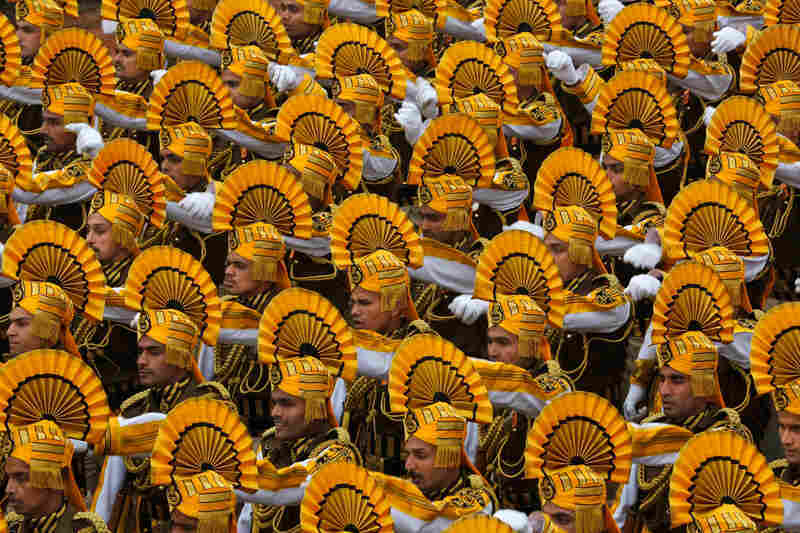 Beyond the show of military power, the parade includes ornate floats highlighting India's cultural diversity. The parade played on a screen for people to watch in the old parts of New Delhi. Obama and first lady Michelle Obama arrive for a photo op during a reception hosted by President Mukherjee at the presidential palace in New Delhi. 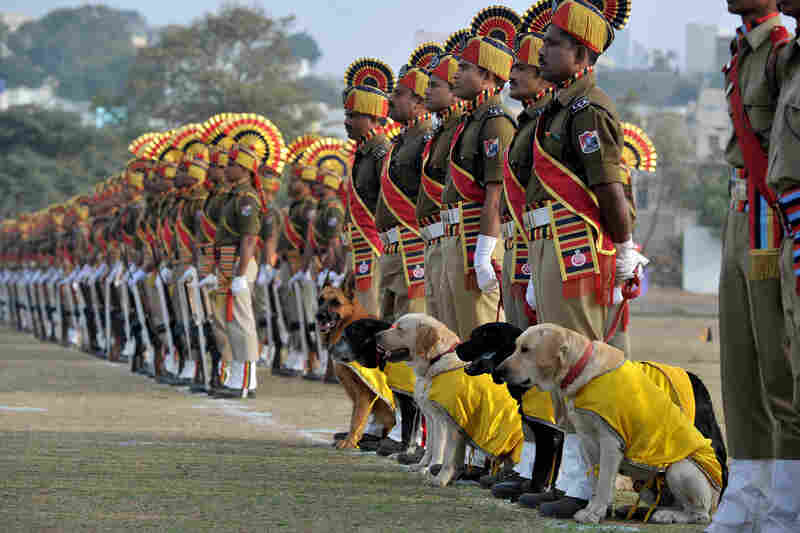 Indian Railway Protection Force dog squad personnel take part in a celebratory march in Secunderabad. 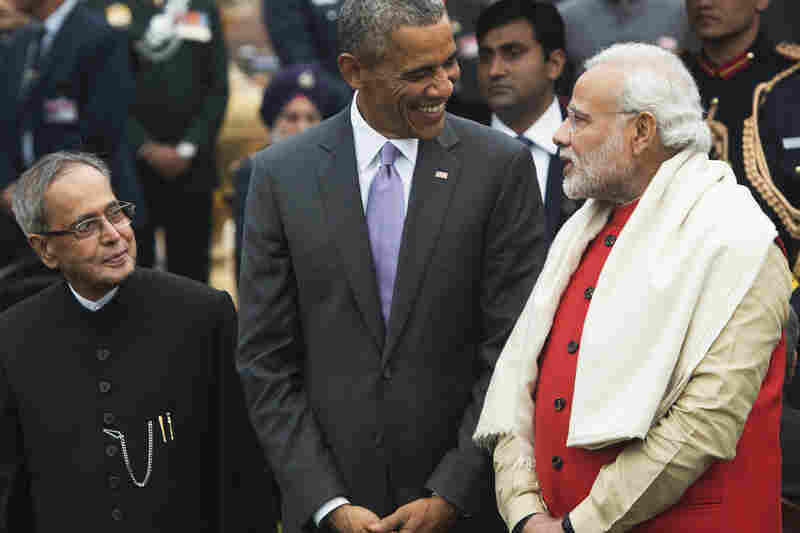 President Obama became the first U.S. head of state to attend India's annual Republic Day parade, which marks the day the country adopted its constitution. 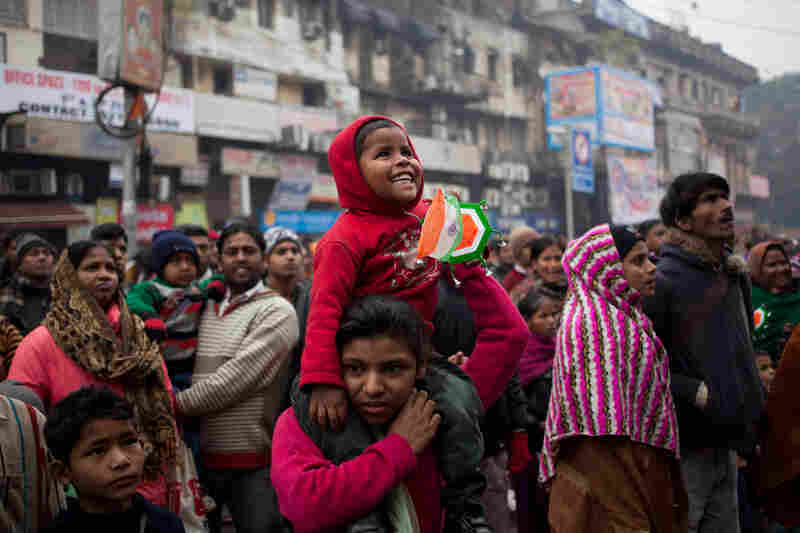 NPR's Scott Horsley, who is traveling with Obama, says the parade is "partly a showcase for the country's military might, but there are also floats honoring everything from India's female mountain climbers to its home-grown industrial development." Julie McCarthy, who is NPR's correspondent in India, says it "was a jaunty occasion despite the rain." "The two leaders and first lady Michelle Obama sat in a bullet-proof, but not weather-proof, enclosure, as colorful floats passed depicting the life of fishermen in the state of Goa [and] matchmaking in the state of Madhya Pradesh. There was a band that played sitting atop camels, performances by schoolchildren. Daredevil stunt riders got the thumbs-up from Obama, the first American president to view India's Republic Day parade, which ended with a flyover featuring a Russian-made fighter jet that flew vertically into the clouds, and left the crowd below breathless." The highlight of Obama's trip so far is what Obama called a "breakthrough understanding" between the U.S. and Indian governments that would allow U.S. companies to help build nuclear plants in India. The nuclear deal was originally signed in 2008, but it was held up because of an Indian law that holds the companies that build nuclear plants and supply equipment liable in case of an accident. The "breakthrough understanding" could help India the world's No. 3 greenhouse gas emitter, cut its carbon pollution.